I haven’t blogged much lately, but my blogging time has really been eaten up by the work on my new online portfolio. I’ve had my blog for a long time now, and it has actually been the reason for quite some jobs ending up on my desk. But I felt that it wasn’t the greatest place to refer to as a portfolio of my maps. Sure you can see a lot of my maps here on the blog, but I felt I wanted to have something that was easier to navigate, where the focus was only on the maps and not so much on techniques and tips and tricks for making maps. So I decided to make a web site devoted only to my maps, a digital online portfolio. Where potential clients can have a look on what I can do, and where they won’t be distracted by a lot of text. To accomplish this I acquired the domain imaginarymaps.se, since I call my little one man mapping company imaginary maps it kind of felt right. 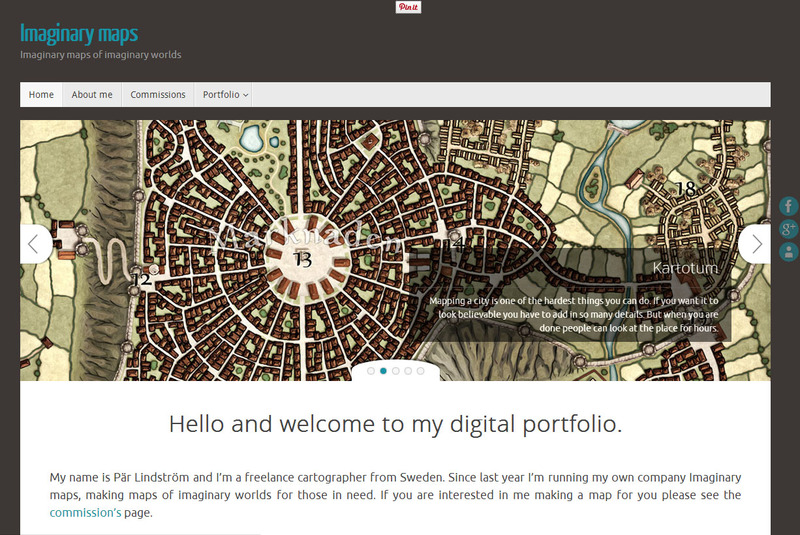 And I’ve put in some time to try to make a good looking portfolio in wordpress. It has been a lot of work, but I am very pleased with the end result. Even though a site like that never will be finished, more maps will be added, some texts will be changed and so on. But it is good enough now to present it to the world.